Cars is a computer-animated film produced by Pixar Animation who firstly released back in 2006. The movie was considered as the best Pixar’s movie which resulting the company worked for the sequel Cars 2 (2011) and Cars 3 (2017). Designed to be a family film, there are some moral values we can extract from that trilogy. We know that Lightning McQueen has a close friend named Mater, also his love Sally, and Doc as his mentor. 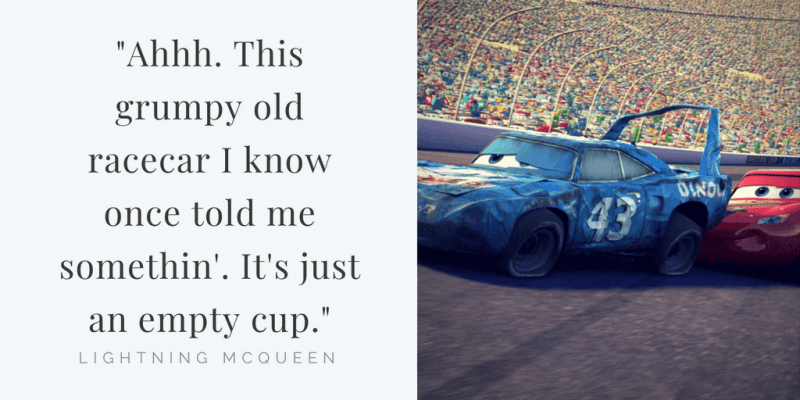 Check out some memorable Lightning McQueen quotes that ever he spoken that may you like. Speed. I am speed. One winner, 42 losers. I’m faster than fast. Quicker than quick. I am lightning! No,no,no,no! No tires, just gas! Uahh! I hate rusty cars. This is not good for my image. Officer, talk to me, babe. How long is this gonna take? I gotta get to California, pronto. Wuuuhuuu! Goodbye, Radiator Springs, and goodbye, Bessie! California, here I come! Yeah! Oh, fell that wind. Yes! No,no,no,no! Outta gas? How can I be outta gas? Speed. I’m speed. Float like a Cadillac, sting like a Beemer. Turn right to go left. Guess what. I tried it. You know what? This crazy thing happened… I went right! No, Mater, I gotta finish this road, and I have to get out of here. Doc. Time to clean out the garage, buddy, come on. What? He has a Piston Cup? Oh, my gosh. Three Piston Cup? Wow! This organic fuel is great! Why haven’t I heard about it before? What do you think? Radiator Springs looks pretty good on me. Let me say that again. Is it getting dark out? Ahhh. This grumpy old racecar I know once told me somethin’. It’s just an empty cup. I sure appreciate that. Thank you. Actually, there is one thing. This is Lightning McQueen. I can handle anything. What’s wrong with fenders? I thought you like my fenders. Those are strong words from a car that is so fragile. How’d you like to come and see the world with me? Mater, look, things are different over here. Which means maybe you should, you know, act a little different too. Okay. He is so getting beat tomorrow. Mater, you have to get a hold ofyourself. You’re making a scene. An imaginary girlfriend, flamethrowers. This is exactly why I don’t bring you along to these things. I made a mistake. But I can assure you, it won’t happen again. I brought my friend Mater along on the trip. And I told him he needed to act different, that we weren’t in Radiator Springs. No, guys, I just really wish Mater were here. I know I made you feel that way before, but none of that matters because we’re best friends! Be yourself here. And if people aren’t taking you seriously, then they need to change. Not you. Wait a second. Fillmore, you said my fuel was safe. I just figured, we never found out who the world’s fastest car is. Plus: no press, no trophy. Just racing – the way I like it. I’ll see you at the finish line, buddy. You know they told him when he was done. He didn’t decide. I don’t want what happened to Doc… to happen to me. Thought you’d be mad about the simulator, I mean this is all great. Look, if I don’t win, I’ll sell all the mudflaps you got. But if I do win, I decide when I’m done. Deal! 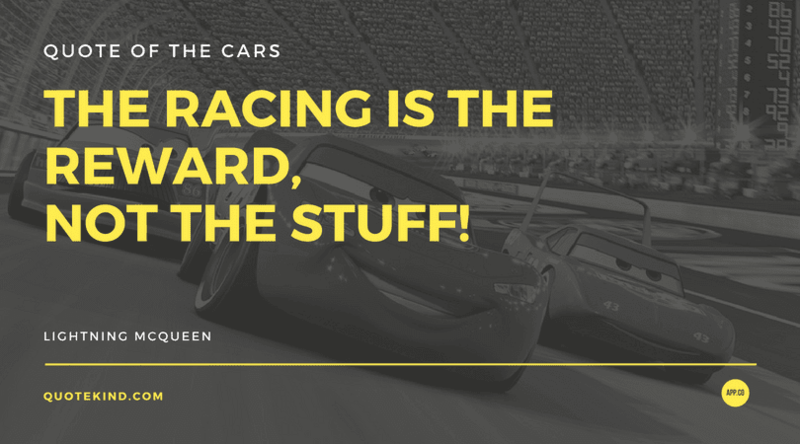 The racing is the reward, not the stuff! I’ve been pretty positive ever since I was a rookie. This is my last chance, Cruz. Last! If I lose, I never get to do this again.